Every morning I get out of bed at around the same time. I have developed a routine – hit snooze once or twice, get out of bed, read my Bible app, put on exercise clothes, debate whether I want to go for a run or not, stand in my bedroom arguing with myself about what’s best for me: rest or run, put on some tennis shoes, sometimes go for that run, sometimes pull up a less-committal online video workout, sometimes go sit in the quiet and eat cereal before I have to wake up my kids. You would think after so many years, I would stop having time-consuming, energy-consuming arguments with myself, but nope, every day it’s me and my mind playing a game of dice. After ten or so years of a regular routine, my exercise life is more consistent than it has been in the past, but never stops being a challenge, at least for me personally. Creating habits and writing them over and over into our brains certainly has benefits, but I also know, this side of heaven, I will struggle to balance all the demands of this life. Even when I know something is good for me, even when I know something is the best for me, like daily reading the Word of God, there is the earthly struggle of Old Self and New Self. Many things continue to holler for our attention, and there will always be the internal voice that tells us wellness doesn’t matter, we’re too tired, and time spent on ourselves is time ill spent. All these voices, external and internal, make wellness intimidating. Several years ago, a group of knowledgeable Lutherans got together to discuss all these tugs and pulls at people, and what it was people actually needed for wellness, based on the Word of God, medical science, psychological and relational health. 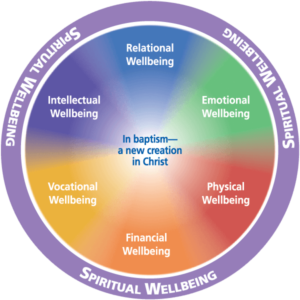 What came out of that conversation was the Lutheran wholeness wheel, which identifies concretely the seven areas of wellness which impact each of us as people. If we neglect or avoid one of these areas in our lives, we will feel the impact in small and large ways, in our bodies, our minds, our strength, our families, our spirit, and more. These seven areas have our baptismal identity at the core – Who and whose we are in Christ – and are wrapped all around by our spiritual well-being. We know that God’s love and grace in Christ, as a free gift, is the greatest wellness investment ever made, and it is made by Him, not us. Everything else we do for our health, spiritual, physical, emotional, vocational, and otherwise, flows out from God’s wellness in Christ given to us. When I go for that run, God is caring for my body. When I meet a friend for coffee, God is caring for my heart and my relationships. When I read a new book, or attend a conference, God is growing my mind. When I rest in His Word, God is growing my soul. This list could obviously go on and on. What ways can you identify today, which God is using, to grow you in wellness? Sometimes it’s hard to identify how God is growing us. Sometimes it’s hard to identify what we need and other times it’s hard to find a resource to help us. 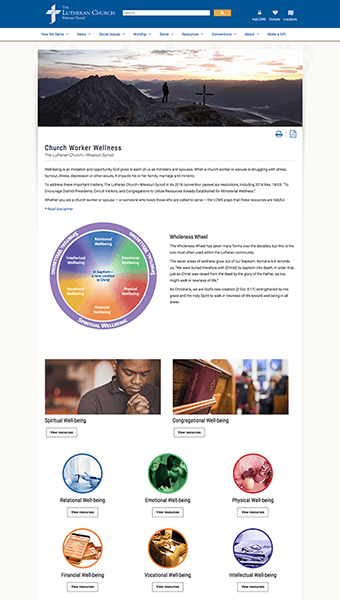 I’d like to introduce you to the worker wellness page, developed by the Office of National Mission of the Lutheran Church-Missouri Synod, with insight and resources from many partners. On this webpage you will find articles, resources, and web links that will help you grow in wellness. The goal is to gather the many, many wellness resources available to you, so that you can find them in one place. On the worker wellness webpage, you can search by wellness category – such as spiritual, emotional, physical, etc. – or you can search by wellness topic. You will find resources which will take five minutes of your time to read, and will give you a small dose of insight, and you will find programs, retreats, workshops, apps, classes, and other resources which provide a longer-term investment in growing your wellness. We also want to extend an invitation to you to share with us what resources have been useful for you and your family, your congregation, your circuit, or your district. The webpage will be updated and expanded based on ongoing research, as well as your input and shared resources. May we spur one another on to better well-being for our bodies, our minds, our strength, our souls, our families, our congregations, and our Synod. He who holds the entire world in His hands, directs and guides each and every step. To Him be glory, in our ministries and in our wellness!